Doina Caragea, PhD, is a Professor at Kansas State University. Her research and teaching interests are in the areas of machine learning, data mining, data science, information retrieval and text mining, with applications to crisis informatics, security informatics, recommender systems, and bioinformatics. Her projects build upon close collaborations with social scientists, security experts and life scientists, and aim to provide practical computational approaches to address real-world challenges. 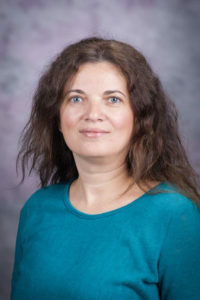 Dr. D. Caragea received her PhD in Computer Science from Iowa State University in August 2004, and was honored with the Iowa State University Research Excellence Award for her work. She has published more than 100 refereed conference and journal articles. Her research has been supported by several NSF grants. Dr. Caragea is a member of the Association for Computing Machinery (ACM), and the faculty advisor for the local chapter of the ACM-W (Women in Computing).